Is The Still Small Voice In Our Spirit Or In Our Brain? My wife has often challenged me in my spiritual walk through life. Her faith is so simple, so clean, so useful, so sensitive, so personal, so… Yet when ill, the extremities of her faith are reduced by the current mental health field to a symptom or a manifestation of her severe illness. Not only is she questioning her faith when ill, but so are they. When her brain is under attack, the circuitry diminished or severely energized, there is still something deeply inside her that is not of rational thought, nor brain induced, but it rises out of her spirit. It is her faith: in her particular case, her faith in Jesus Christ. I once ask a mental health worker for coping skills that would get me through not only this day of trauma, but also for tomorrow. He smiled at me and said, “Do what you have been doing. Rely on your faith. I see that it is very strong in you.” When faced with the trauma of pain, conflict, uncertainty, and even possibility of physical danger to oneself or one’s loved one, trying to sort out one’s faith in practical experiences is challenging when facing mental illness and its implications. In fact, it digs into the depths of one’s soul. I am happy that NAMI, National Association for the Mentally Ill, a secular nonprofit organization that has had a tremendous impact on my life when facing and trying to understand mental illness, is beginning to not only recognize but embrace Faith Base influence with mental health. Recognizing that the mind affects the body, the spirit has often been sideline by the influence of science in the mental health field. Religion and science have clashed for centuries, but the spirit and science can work together. Man is composed of mind, body, and spirit if it is to have a holistic approach to health. My wife has used journaling in her spiritual life, asking the Lord for answers to difficult questions as well as direction, and then writing responses on paper to her questions. She has often gotten phenomenal supernatural results in those responses, but when faced with the effects of depression producing guilt or mania producing hyper-religiosity, she has had to lay her spiritual journaling aside because she cannot trust her “inner voice”. This has been a precious and difficult thing for her to do. The strength of one’s faith is “trusting that inner voice” inside you. Unfortunately that “inner voice” also gets attacked when mentally ill. That is why mental illness is so cruel; it attacks not only your mental, but also physical, emotional, and spiritual connections. You can get “stripped” of who you are in all those areas when mentally ill.
A person of faith who is mentally ill always has difficulty with the Crisis Intervention Mental Health Professional who ask, “Does God speak to you? Can you hear God’s voice? Do you hear any voices?” Their questions are necessary, for schizophrenic voices are a reality, but so is that inner spiritual voice. It is difficult for the scientific world to distinguish between the two, and difficult for the consumer, the one ill, to confess or expose their “inner voice” to these professionals. 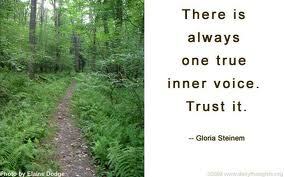 Amazingly, as a caregiver, it is still that same inner voice that guides me through tough decisions. Some people say it is shooting from your gut or your hip. I have often found myself having to dig deep when facing challenges, challenges that occur daily or even momentarily, challenges that I have had no control over, and challenges I had no solutions at that moment for. I have that “inner voice” and am healthy. My wife too has her “inner voice” that is often cruelly attacked, but I recognize that she still has it. When recovering, when healthy, I see her “inner voice” coming back, just like her personality coming back, who she “is” coming back. She does have an “inner voice”. I am beginning to believe that our “inner voices” are connected to both our mind, body, and our spirit. Newer PostIs Any Church Immune From Mental Illness? Older PostDid Paul Have Epilepsy?